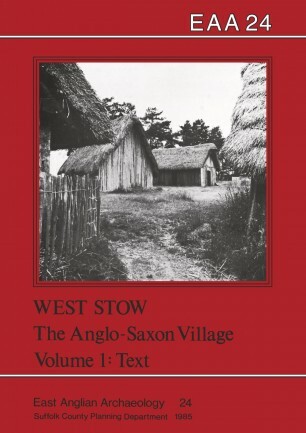 West Stow is one of the most important Early Saxon settlements to be excavated, since it was virtually complete, and devoid of later occupation. The cemetery nearby was investigated in the early 19th century, and contained predominantly inhumation burials. A cremation cemetery at Lackford, a mile away, may also be associated. The settlement began in the early 5th century, on an unoccupied site, and continued into the 7th century. The prehistoric and Roman background in the area is discussed, as is the pattern of Early Saxon settlement elsewhere in the Lark Valley. The site consisted of 70 sunken-featured buildings, arranged in groups around 7 ‘halls’, representing 3 or 4 family groups at anyone time. The purpose and reconstruction of these buildings is extensively discussed, using parallels in this country and abroad. 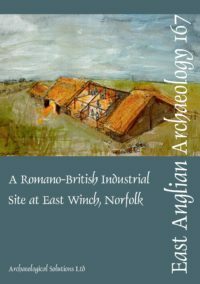 The reconstructed buildings in the West Stow Country Park add a unique dimension to this report, and the accidental destruction by fire of one of them allowed an archaeological investigation of the remains (see forthcoming EAA report, Experimental Archaeology and Fire). Abundant evidence of local crafts was discovered, such as bone and antler working, weaving and potting. The combs were particularly well-preserved, and rare evidence of antler pottery stamps was found. The faunal remains constitute one of the largest collections in Britain and provide valuable evidence for the environment and economy of the site. The conclusions bring together the archaeology of the settlement and the finds from the cemetery, placing them in their context in the history of the settlement of the Lark Valley. This popular report sold out years ago, but has now been reprinted.